When a salaried employee has worked less hours than allotted in a pay period and doesn't have sick or vacation hours to cover the difference, you can pay the employee for hours worked instead of a regular salary amount. In QuickBooks Desktop Payroll, you can edit the salary rate directly on a paycheck to pay a partial or prorated salary amount. A common way to determine a salaried employee's hourly rate is to take their annual salary and divide it by 2080 (total hours worked in a standard year based on 40 hours per week). You can then multiply the hourly rate by the number of hours the employee worked in a the pay period. Example: John's salary is $30,000. $30,000/2080 = $14.42 hourly rate. John only worked three business days (24 hours) for this pay period. The amount to enter in the Rate column on the paycheck is $14.42 x 24 = $346.08. Step 1: Access the paycheck details by running your payroll. 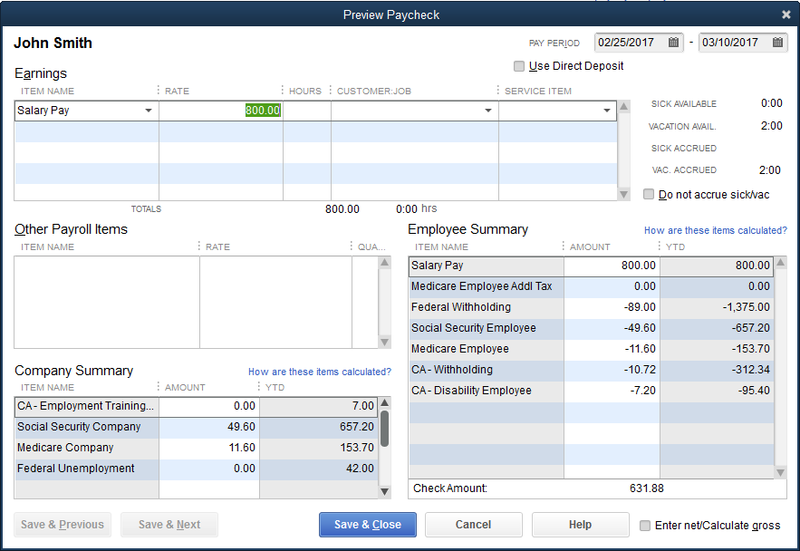 In your QuickBooks Desktop menu, select Employees > Payroll Center. Under Create Paychecks table, select the Payroll Schedule for the desired pay period and select Start Scheduled Payroll. Ensure there are checkmarks on the employees you will pay for this period. Select the name of any employees that have partial payment for this period to open the paycheck detail. Alternatively, select Open Paycheck Detail to review paychecks. Step 2: Edit the salary rate directly in the Preview Paycheck window. Look for the salary item under the Earnings table, and highlight the amount under the Rate column. Enter the correct salary rate for this pay period based upon hours worked. Press the Tab key on your keyboard to recalculate the taxes. Review the paycheck and make any other necessary adjustments. Select Save and Close to go back to the list of employee paychecks or Save and Next to preview the next paycheck.